OC Mom Blog: GLITTERFUL FELT STORIES WELCOMES SOME NEW GLOVE PUPPET SETS!! GLITTERFUL FELT STORIES WELCOMES SOME NEW GLOVE PUPPET SETS!! 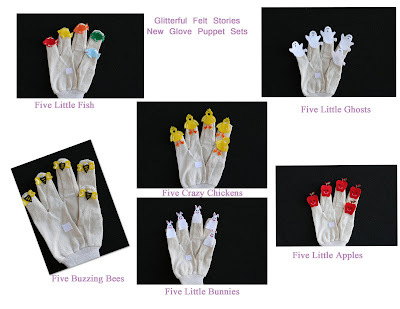 We are excited to welcome six new Glove Puppet Sets to our Company Store!! Glove Puppets are a wonderful learning tool and can help bonding between you and your child! They will provide you and your child with hours of fun!! They are available for an affordable price of $5.00 each!! GLITTERFUL FELT STORIES BLOG'S NEW DOMAIN NAME!! FREE KIDS SLEEP TRAINING BOOT CAMP!! ON THE HUNT FOR THE BEST PATTY MELT RECIPE!! TEN WAYS TO TELL YOUR CHILD "I LOVE YOU"
FREE GLOVE PUPPET FOR YOUR FELT BOARD STORY! !